These red-work quilts are from the Outdoor Quilt Show. I went on Saturday. If you want to see more of the quilts that were displayed check out my family blog - Prytz Family. I'll be doing various "quilt" post all week. 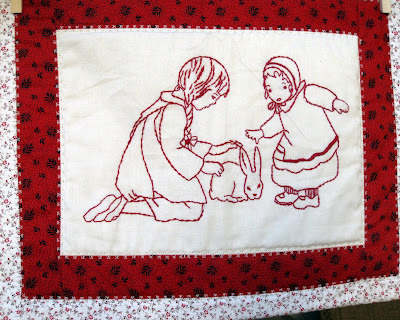 The embroidery is so pretty on these quilts. I haven't seen any red work in quite a while so this is a nice treat. 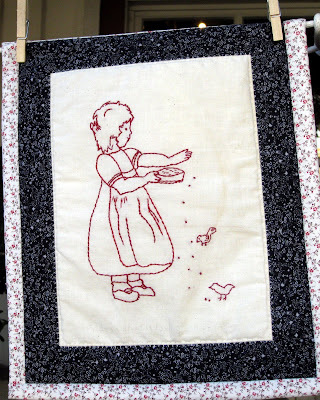 I've always loved this kind of embroidered quilt work. Red is the favorite color of the antique ones. These quilts are so nice - the simple lines of each piece is what make these so good looking. Any of these will look great on the off-white walls of a gallery. Simple is beautiful! 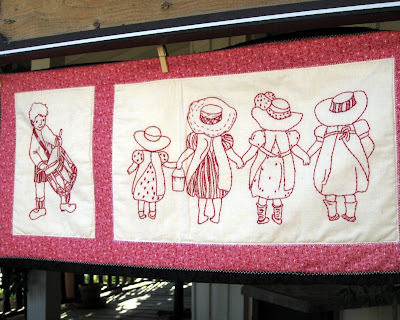 I love the 'old-fashioned' style to these quilts - very nice! Oh cute quilts! Very creative! Happy RT! that's a very pretty quilt, but I don't know if I have the patience to make one! Those are beautiful! I have yet to try to do one...although I know several people who make beautiful quilts. Very nice RT post. Such fantastic quilts, love them! What sweet illustrations, they must take so much patience to do. Perfect for RT! Lovely quilts! Beautiful quilts they are just wonderful for RT this week, something homemade and happy!